The collection of photos attests to Taiwan’s transformation from an agrarian past into a high-technology nation at present. Through images, the exhibition introduces digital life in Taiwan and their goal of becoming a “knowledge-based economy.” By viewing these photos, spectators may gain a better understanding of Taiwan, one of Asia’s most advanced e-economies. 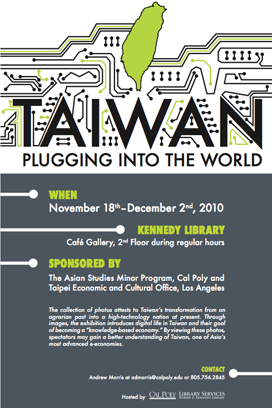 Exhibition is free and open to the public during regular library hours. TGI Friday! It's 4:02pm right now.